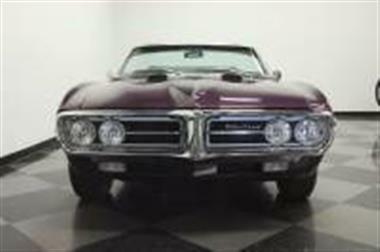 1967 Pontiac Firebird in Lutz, FL for sale. 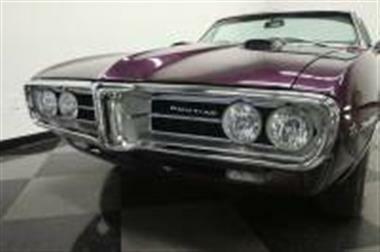 This 1967 Pontiac Firebird convertible is a true purple people eater. 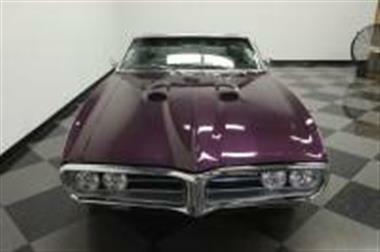 With four-on-the-floor and a 455+ cubic-inch punch under its pointed hoodand#44; it might look handsomeand#44; but its also one quick droptop.<br /> <br><br> Theres no sneaking around in a Firebird convertible painted Plum Mist. 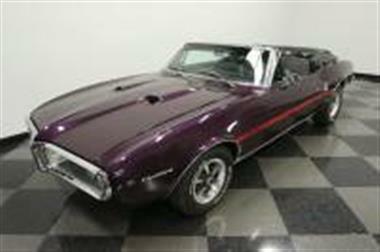 This was on the factory color list in 67and#44; but its exceptionally more striking than what they could do back then. 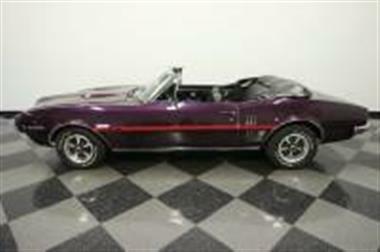 Its dripping with the kind of clearcoat shine that rivals chrome bumpers and trim. 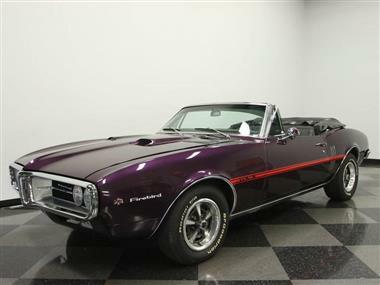 And speaking of the brightworkand#44; dont you just love how the integrated pointed front bumper gives the 67 Firebird a true beak-like appearance? A convertible that has been restored but not modified means no deck lid spoiler or other add-onsand#44; just a clean F-body that looks like a million bucks. Of course this one can still get a bit boisterous with cool factory elements like the hood scoopsand#44; red side stripesand#44; and Rally II wheels with PMD (Pontiac Motor Division) center caps.<br /> <br><br> Underneath the new black folding roof is a black bucket seat interior that has been nicely restored to appear like youre driving out of the Pontiac showroom in 1967. It feels so authentic right down to the heat/defrost control and factory AM radio in the wood paneling dash. But what youll really enjoy is the muscle car feeling that comes from the deep black seatsand#44; door panelsand#44; and carpeting. 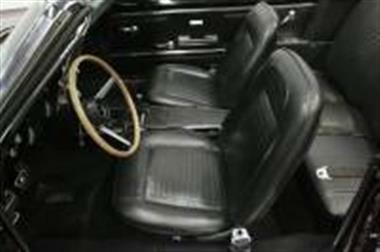 The three-spoke sports steering wheel with PMD horn cap is a great looking pieceand#44; and the Hurst shifter sticking out of the center console is just begging for your right hand.<br /> <br><br> When you open the hoodand#44; dont let the flash of the polished components keep you from discovering this Pontiacs secret. 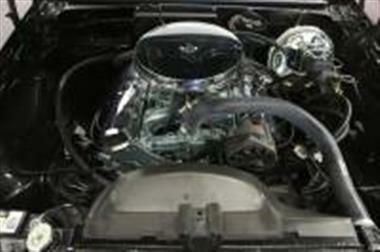 These first year Firebirds topped out at 400 cubic-inches. That was plenty of powerand#44; but this one hides an upgrade that comes from later in the muscle car wars. Its running an extremely desirableand#44; monster 455ci V8 borrowed from a 70s Pontiac. And it doesnt stop thereand#44; because it also has been bored .30 over. Thats a lot of American muscle for you to commandand#44; and everyone knows it thanks to the rumbling dual exhaust. Best of alland#44; this Firebird give you complete command over the sound and fury of the big V8 thanks to the Super T-10 four-speed manual transmission. Add in the power steeringand#44; front disc brakesand#44; and modern BF Goodrich T/As at all four cornersand#44; and this big motor ragtop is also a fine Sunday driver.<br /> <br><br> This Pontiacs great original looks are backed up by the owners manual thats included with the sale. These first-year Firebirds are a rarityand#44; especially when so nicely restored. So yesand#44; you do need to hurry to grab this deal. Call today!! !